The Federal is a moderately priced hotel in Soi 11, which is a thriving side road with pubs and restaurants off the major arterial road to the east of Thailand, Sukhumvit Road. The hotel has a small swimming pool and a Coffee Shop, and it’s the latter which frequently attracts us to the place. The Coffee Shop has a varied menu of Western, Thai and Chinese food at very reasonable prices. It’s clean and the staff are efficient and friendly. It’s a great place to grab a quick bite as you never have to wait long for your food. Our favourite is their noodle soup. 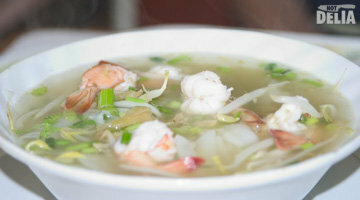 You can see the prawn version in the photo above, although they also do pork or chicken noodle soup. It makes a great breakfast – especially after a night on the town in Soi 11! 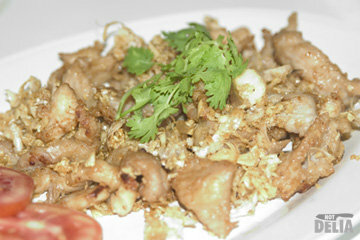 Another of our favourites is their fried pork with garlic, pictured here. We probably wouldn’t go there for dinner but for a quick snack or a reviving noodle soup, it’s very hard to beat. Unfortunately, it’s not suitable for wheelchair users because, as we’ve found in so many places, the toilets aren’t easily accessible.